This is where it all begins, how exciting! 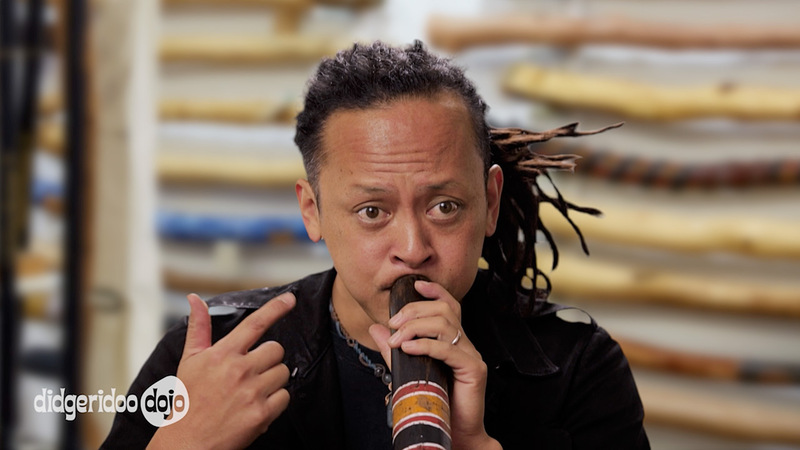 In this section, we show you how to play the didgeridoo. We go through all the fundamental techniques that form the building blocks of your didgeridoo playing. The great news is that it is quick and easy to learn, so you will be sounding fantastic in no time! We also teach you circular breathing which is a very cool technique that will allow you to play continuously. Sweet! If you’ve already been playing for a little while, still expect to learn some golden tips here that will take your playing to a new level. To begin, scroll to the bottom of this page or navigate using the menu on the top left hand corner of this page. Myth: You can’t play unless you can circular breathe. Well actually on one breath you can play many sounds on the didgeridoo. Myth: You need massive lungs to play the didgeridoo, I just don’t have enough puff. Playing the didgeridoo is about a controlled release of a small amount of air, only possible when you are relaxed and playing gently. Myth: I’m too old to play the didgeridoo. There are people from 3 years old (maybe even younger) to 93 years old (maybe even older) around the world learning and playing the didgeridoo right now! Myth: It looks far too difficult for me. The didgeridoo requires no “musical ability” and with only a very small amount of practice you can sound fantastic. Posture is important when playing your didgeridoo. It is best to be comfortable and in an upright position. The sound you hear when playing the didgeridoo is far different from the sound that everyone else hears when they listen to you. Most of the sound you hear is the dull vibration in your head… a bit like talking with your ears blocked. To help hear more clearly while you practice, find a spot in your home with the best acoustics (the bathroom is excellent!!!). Also try playing with the didgeridoo up against a wall or hard surface so the sound bounces straight back to you. Playing the didgeridoo is about a controlled release of a small amount of air. It is about a relaxed, gentle vibration of the lips, it has nothing to do with blowing hard down the instrument. Blow a gentle amount of air through your lips. While keeping them relaxed, bring your lips together and they should start to vibrate together. Some people describe this vibration as “blowing a raspberry”. This may feel quite unnatural at first as you probably haven’t done this since you were very young. Keep practicing, it will get much easier very quickly. This is the most important technique as it is actually the sound of your lips vibrating that gets amplified down the didgeridoo to produce the drone, not the amount of air going down it. Place your lips inside the mouthpiece to form a gentle but air-tight seal. Blow the same raspberry and you should feel the didgeridoo vibrate. At first your brain will try to take over and tense your lips up tight… you may hear a spitting/trumpet sound. This is perfectly normal to begin with, you just need to relax as you did without the didgeridoo. Pay attention not to let any air leak out between your lips and the didgeridoo mouthpiece. This will make it almost impossible to play. Remember, a gentle but airtight seal. Keep practicing this until you can get the drone happening more consistently with each breath. You may notice that one whole lungful of air may only last 1 or 2 seconds. Your challenge with this technique is to get the drone to last between 5 and 10 seconds or more from one breath. Click here for more on making the didgeridoo drone sound. Try tightening up your lips a little to control better, the amount of air coming out. Be careful not to go too tight and lose the drone. Rather than trying to blow air down the didgeridoo, focus on holding your breath and letting just enough air come out to vibrate your lips only. Any extra air is waisted. Trying altering where you put your mouthpiece on your lips. Try either side, or front on. There is no right or wrong, just whatever works best for you. If you have a beeswax mouthpiece, try adjusting the size and shape of the hole. The bigger the hole, the easier your lips will vibrate but the more air it will take. Find the right size for you. About a 3cm diameter is a good place to start. Try keeping your cheeks in rather than puffed out. This will help to get a tighter clearer sound and will use less air. Your challenge now is to make one lungful of air last 15 – 60 seconds. 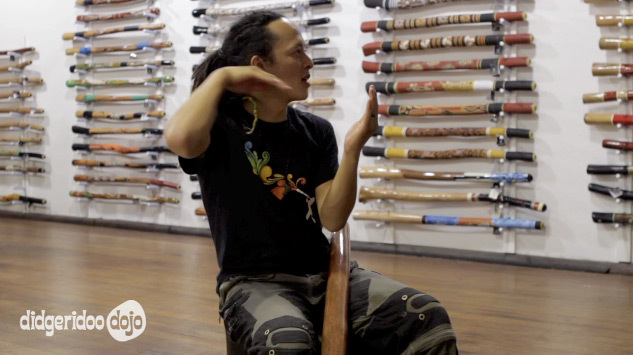 Click here for our lessons on sharpening your didgeridoo drone. Changing the position of your tongue and the shape of your mouth while playing the didgeridoo will make some truly unique sounds. Unlike using your voice, the following exercises are done by mouth movement only. Use your tongue to mime the phrase “dar… dar… dar…” while playing the drone. You will notice that the letter “d” stops the air coming out briefly. Try this both slow and fast but always controlled. Use your tongue to mime the phrase “dee… dee… dee…” while playing the drone. You will notice the sharper drone sound by miming the “ee”. Mime the word “did-ge-ri-doo” while playing. To begin with keep the syllables separate and clear. At first you may only hear a subtle difference in your drone but keep up the practice, it will get clearer and clearer. Now experiment to see what other sounds you can make by moving your tongue and mouth. Click here for lessons on tongue & mouth shapes including making the Kangaroo sound! The diaphragm is the muscle under your lungs that controls the air going in and out of your lungs. Similar to mouth shapes, you do not need to add any voice when trying these techniques. To use the diaphragm in short bursts as you would when laughing, try without your voice saying “ha… ha… ha…”. Now try this again while playing the didgeridoo. This will create pulses in the drone. You can experiment by changing the speed and loudness of the pulses. Begin soft and gentle, then build to stronger pulses. Find what feels comfortable for you. Click here for our lessons on playing louder & quieter by using your diaphragm, and lessons on diaphragm pulses. Circular Breathing is a key component of playing the didgeridoo. The first half of our circular breathing lessons are completely free. Click the image to access the circular breathing lessons and learn more. The concept of continuous didgeridoo playing while breathing in can be broken down into simple steps. While doing these steps, forget about playing the didgeridoo, this is a breathing exercise. Circular breathing (or cycle breathing) is not about filling your lungs up when they are empty, it is about taking small, regular breaths to keep them topped up. Your lungs should remain 50 – 70% full through this whole exercise. Fill your mouth with water. Now practice spitting this water in a long thin stream at a target about 1 meter away. Now as you spit out the stream of water, take a long gentle breath in through your nose. You may need to try this a few times for it to feel comfortable. The most important part of this exercise is that your breath in happens at the same time you are spitting out the stream of water. Now fill you mouth full of air. Practice spitting this air in a long thin stream at a target about 1 meter away, the same as you have done with the water. Now as you spit out the stream of air, take a long gentle breath in through your nose. You may need to try this a few times for it to feel comfortable. Again the most important part of this exercise is that your breath in happens at the same time you are spitting out the stream of air. This should sound like a spitting sound. You now have air coming out of your mouth at the same time you are breathing in your nose… congratulations! Still without the didgeridoo, relax, close your eyes and practice this breathing technique until you are entirely comfortable with it. *Spit out a long stream of air as you take a gentle breath in through your nose. Your lungs will now be full. *Gently exhale through your mouth to empty you lungs. *Repeat A and B until completely comfortable. Practice the same technique as step 6 with your mouth on the didgeridoo mouthpiece. DO NOT TRY AND PLAY THE DIDGERIDOO, THE SOUND QUALITY IS IRRELEVANT. Get comfortable with this technique as you now have everything in place to circular breathe. Continue as in Step 7, but now when you are exhaling through your mouth, relax your lips to play the drone. Still maintain the spitting sound as you are inhaling through your nose. Do not rush this exercise, it is still great to have the spitting sound at this stage. The most important thing is that a sound is coming out of the didgeridoo while you are inhaling. Practice Step 8 continuously, slowing relaxing your lips during the spitting/inhaling stage of this exercise. As you get more comfortable your didgeridoo sound will become a more consistent drone and the spitting sound will disappear. Do not rush this process, this may take some practice. As you practice, the gaps between the drone and spit will disappear. When you first master this technique, you may only get 2 or 3 breaths before your lungs are empty or too full. Once you have the technique, you can balance how much you inhale. Keep practicing until you can play continuously for over 1 minute. It is normal for the drone to change sound as you take a breath. When you first get the breathing you will probably get so excited that you will forget it. Don’t panic it will be back!!! Must know information before you pick up your didgeridoo. How to hold, where to play, different didge sounds, and how to warm up to sound your best. This is where it all begins. Undoubtedly the most important section of all... getting you didge vibrating and your body shaking, oh yeah it's a great feeling. In these lessons, we teach you how to make a drone that sounds great. Adding you voice allows you to make the dingo, dog howl and the great Australian Kookaburra! 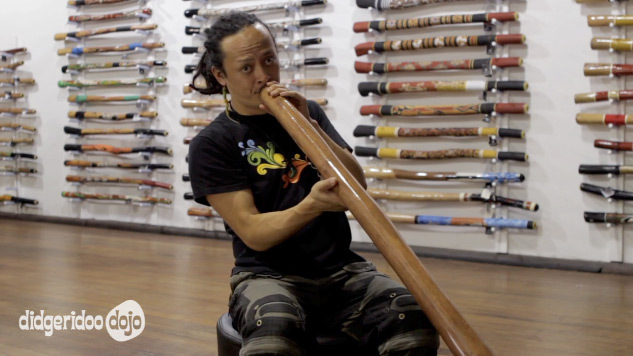 We show you how to make these awesome sounds on your didgeridoo. In this section we show you how to make that sound that every learning didge player wants to make. And its a lot easier than you think. Want to play louder? Want to play quieter? 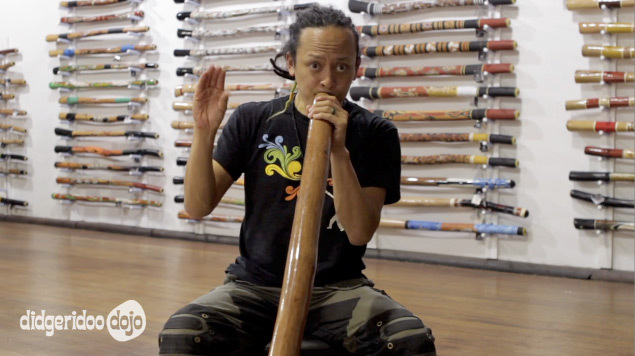 Here we show you how, and even more exciting... we get you playing a rocking didgeridoo rhythm! This is the exciting part where we put everything you now know together, into didgeridoo rhythms. Not only is playing rhythms on your didge extremely satisfying and fun... it is excellent practice for your circular breathing. So even if your circular breathing is a little shaky, give these a go. You've made it! What a ride. Well done, you have achieved so much on the didgeridoo! It's time to give yourself a huge pat on the back. And now brace yourself... and get stuck into the Intermediate section to take your playing to a whole new level!